The PopArt artist Diana Catherine Eger, born in Frankfurt am Main in 1980, painted since her childhood. She never visited an art academy, but studied economics and political science. She ways always drawn to creating and working with her hands. After a short intermezzo in investment banking she decided to paint. Diana is an artist that truly believes that art is created to nourish the eye and heart. The choice of vibrant colors which depicts her positive view on life is one of her main characteristics and the one that captures the eye and imagination of the viewer. Another focus are the characters in her paintings. Diana has developed a unique technique with which she presents current themes and well-known personalities. 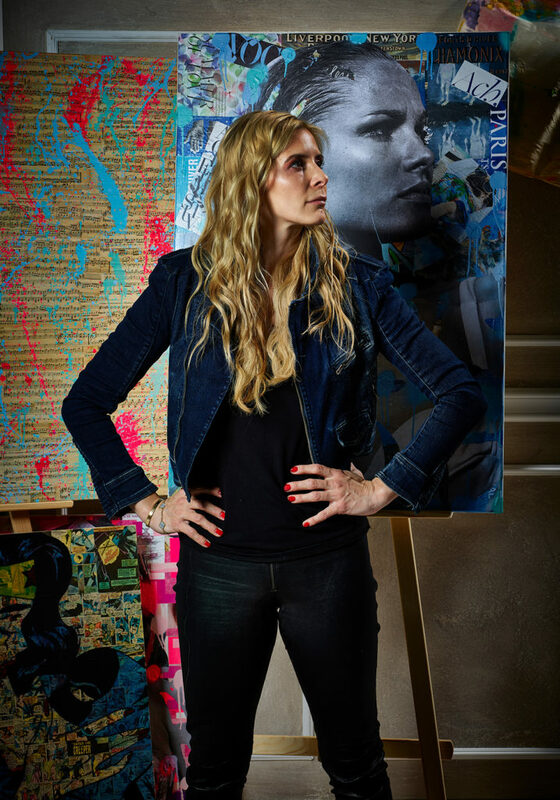 She does not spray on walls and trains, but brings her art with graffiti spray paint in street art style to traditional canvas or aluminum plates – creating extraordinary. Eger’s large-scale paintings play with the vitality of the media age between fiction and reality. The portraits refer, on the other hand, to pictures from television, music or film, but also to the elegance, beauty, and charisma of the depicted characters. Personalities such as Helmut Kohl and Romy Schneider are placed in relation to masterpieces of art. Frankfurt is the birthplace of Diana Catherine Eger, her habitat is the world, both the real three-dimensional and the digital media world and the separate reality of her imagination. This can be seen and felt quickly and directly, even at the most fleeting glance at her work. A brief lingering on the surface, a fascination of superficiality, of the exterior and the intuitive grasping that even the innermost has an exterior and is perceived from there.